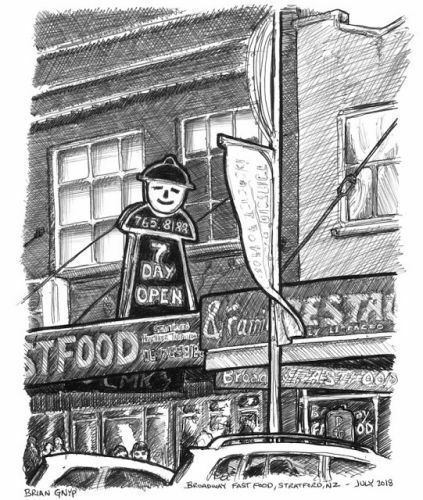 This is a sketch of the signage for a takeaway restaurant in Stratford. My favourite part is the hand-painted signage since we're seeing that kind of stuff less all the time. Most businesses these days have computer printed signs and the hand-painted sign is a bit of a lost art. My second favourite part is the claim of the "Great Tasting Healthier Takeaway". That seems a pretty gutsy, yet hard to prove, boast. Finally, the fact that this place is "Fully Licensed". So basically if you're there to pick up some fish & chips, you can probably get a gin & tonic.